To report the first case of pleomorphic adenoma (PA) arising in the ear lobule, and overall, the sixth case of PA in the auricle in medical history. A 28-year-old young male presented to us in the outpatient department with a small, painless, firm, freely mobile swelling in the left ear lobule for past 3 months. The patient wanted excision of the swelling for cosmetic purposes. Fine-needle aspiration of the swelling suggested features consistent with PA. The tumor was excised under local anaesthesia. Postoperative histopathological examination confirmed the findings of cytology. There was no recurrence during the 8-month follow-up. PA can rarely arise in the ear lobule, which is to be treated by complete surgical excision. Pleomorphic adenoma (PA) is a benign mixed tumor arising from the salivary glands. Although most of them arise from the major salivary glands, PA can arise at unusual anatomic sites where minor salivary glands are found. Oral cavity, external nose, oropharynx, parapharyngeal space, larynx, esophagus, lacrimal gland, trachea, and mediastinum are a few unusual sites reported in the literature as origin of PA. ,, The external ear is another very unusual site where PA can arise. Most of the cases have been reported from the external auditory canal. Only five cases of PA arising from the auricle have been reported. We report the sixth case of PA arising in the auricle and the first case arising in the ear lobule. 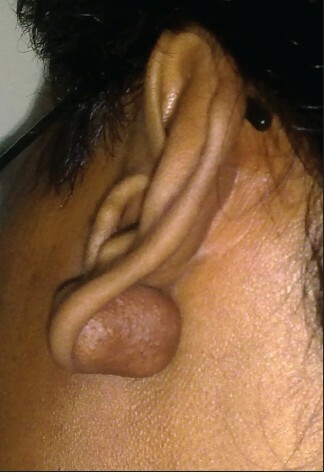 A young man, aged 28 years, presented to our outpatient department with the complaint of a small swelling in the left ear lobule for the last 3 months. The swelling was insidious in onset and slowly progressive over the last 3 months. It was painless and there was no history of ear piercing or trauma. On examination, the swelling was nontender, firm, and freely mobile [Figure 1]. The preauricular and postauricular regions were normal. The patient wanted removal of the swelling for cosmetic purposes. Fine-needle aspiration cytology (FNAC) was done prior to surgery for cytopathological diagnosis, which showed cellular aspirate with a large amount of chondromyxoid matrix. Epithelial cells were present in sheets as well as singly along with many myoepithelial cells. Features were suggestive of PA. The tumor was excised in toto under local anaesthesia. The postoperative specimen measured 2.5 cm × 2 cm × 1 cm. 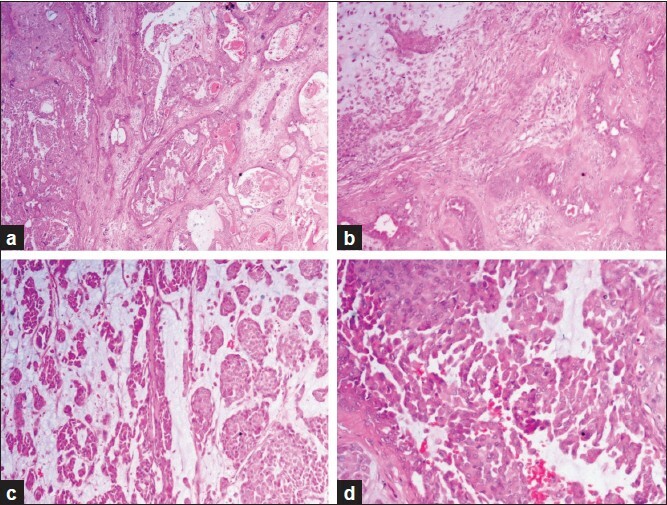 Sections examined revealed a well-circumscribed tumor showing chondromyxoid substance with admixture of myoepithelial and epithelial cells, [Figure 2]b- c while other sections showed ducts and epithelial islands [Figure 2]a. The epithelial cells had nuclei with uniform bland chromatin [Figure 2]d. No areas of necrosis or mitotic figures were identified. Histopathological features confirmed the diagnosis of PA. There is no recurrence at 8 months of follow-up (till date). PA of the auricle is very rare. It can arise either from heterotopic salivary gland tissue or from sebaceous glands of the skin. If it arises from the sebaceous glands, it is known as ''chondroid syringoma or mixed tumor''. However, histologically PAs arising from the sebaceous gland and from the salivary gland are the same. Generally, PAs in the auricle present as small, nontender subcutaneous masses, which are either slowly progressive or static in size. On the auricle, they are generally asymptomatic, and the patient seeks consultation for cosmetic purposes only, as in our case. Our case is the first case of PA arising in the ear lobule, as all previously reported cases have been demonstrated to be arising from the helix. Radiology is generally not needed and FNAC can be done for diagnosis. Excision of the swelling can also be done directly, as excisional biopsy. Complete surgical excision is the treatment of choice. If the PA is arising in the helix, either wedge resection of the auricle or resection of tumor, along with skin, cartilage, and perichondrium, can be done. Preservation of the opposite side of perichondrium should be done. If the skin cannot be preserved, skin grafting is required. In our case, tumor was present in the ear lobule, so it was easily excised with preservation of the skin. Recurrence can occur if the tumor is removed incompletely. PA of the auricle is very rare. Complete surgical excision is the treatment of choice to prevent recurrence. 1. Badia L, Weir JN, Robinson AC. Heterotopic pleomorphic adenoma of the external nose. J Laryngol Otol 1996;110:376-8. 2. Nardone M, Ferrara G, Nappi O, Di Maria D, Villari G. Pleomorphic adenoma in unusual anatomic sites: Case reports and review of literature. Acta Otorhinolaryngol Ital 2002;22:158-63. 3. Porter N, Sandhu A, O'Connell TB, Selva D, Leibovitch I. Pleomorphic adenoma of the palpebral lobe of the lacrimal gland. Otolaryngol Head Neck Surg 2007;136:328-9. 4. Yim YM, Yoon JW, Seo JW, Kwon H, Jung SN. Pleomorphic adenoma in the auricle. J Craniofac Surg 2009;20:951-2. 5. Nishimura S, Murofushi T, Sugasawa M. Pleomorphic adenoma of the auricle. Eur Arch Otorhinolaryngol 1999;256:22-4.